What does training look like in your group? How do you create a culture of learning in your group? What are some examples of caring for each other in your groups? How do you create a culture of caring for one another? What are some examples of how your Community Group is reaching out to others? How do you create a culture of evangelism? What are some examples of leadership development in your group? How can we create a culture of leadership development in our groups? Every Community group has its own collective personality. What would you say is the personality of your current group? Which of the four pillars are strengthens in your group? In which are growth areas? What are some of the biggest challenges you are currently facing in your group? What are some of the most exciting things you see God doing in your group? Yee and Carolyn Feng's Community Group is going to be taking down all the Christmas decorations this Thursday, January 10th from 6-8pm at Rainier Valley Church. Everyone is invited out to help clean up and the Fengs will be providing food. Hope to see you there! Happy New Year, church! We’re off to a busy start! We need help putting away Christmas decorations this Thursday from 6:00pm to 8:00pm. If you’re available, please stop by! The next Board meeting is Monday, January 14th. Please reach out to Sam Bretz (Samueljbretz@gmail.com) for details. Our next member meeting is Sunday, January 27th after service. If you’re interested in becoming a member of RVC, please contact Pastor Kyle at kyle@rainiervalleychurch.com. The deadline to sign up for the Philippines trip is January 31st. For additional details, or to learn more about GCE Ministries, please contact Sharon Pastre at sharon.gce@gmail.com. Did you think Jesus was stronger or weaker because he had been fasting? Have you ever fasted before and if so what was the experience like? Satan tries to tempt Jesus in his hunger, what ways does Satan come against you and tempt you? What we feed grows and what we starve dies - What habits are you feeding? Satan tries to misuse the scriptures to get Jesus to obey him, what ways have you seen the scriptures being misused? The scriptures are a weapon that Satan can use against us if we don't wield them well, how can the Bible be dangerous? What ways might you try to change the plain meaning of a scripture to make it say something you want it to say? Jesus could have the Kingdom without the cross but what would he lose if he took the Devil's offer? What areas of pride do you see in your own heart and how does the Devil use these areas of pride to tempt you towards compromise? In 1 Cor 10:13 we are promised that there is always a way out of temptation. What are common temptations that you face and what does the way out of those temptations look like for you? Let's pray for each other to resist temptation and to walk in the light of God's love. On Sunday, January 13th RVC's Kids Ministry will be hosting Brent Capatch, Kids Ministry Director at Cross & Crown Church, for a special kids ministry training. If you serve in kids ministry or are interested in kids ministry, please plan on being on attending this training. 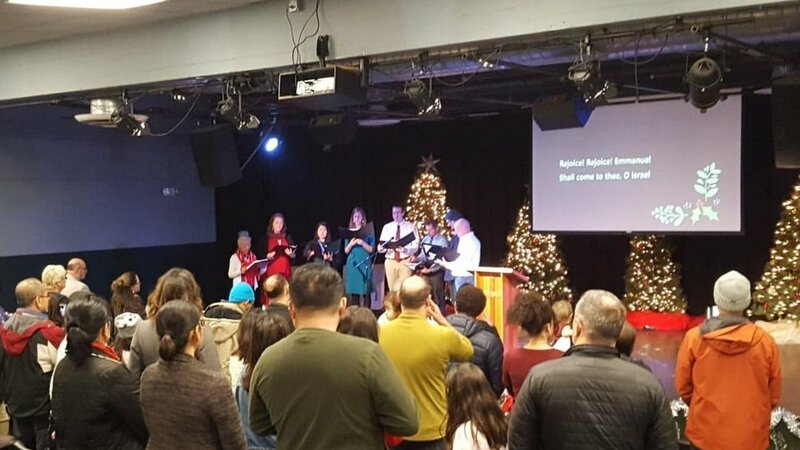 The Rainier Valley Church family will be joining together on Wednesday, January 9th to fast and pray for one another and for this next year of ministry in South Seattle. Fasting is voluntarily going without food or some other necessity to intentionally set aside time for prayer, scriptural meditation, and worship. There are many biblical reasons for fasting that are outlined below. RVC will plan to fast from 6am-6pm or sunrise to sunset this coming Wednesday, January 9th. This would mean fasting from regular breakfast and lunch meals as well as any daytime snacks. We will break the fast at dinner on Wednesday night. If you have health issues that prevent you from fasting from food, please considering fasting from Television, social media, or whatever good gifts of God take up margin in your life. Fasting is about self-denial, creating margin, opening up space and stretching our perspective beyond the temporary to the eternal. Welcome to the year 2019! As we begin a new year together it’s important to consider what God has done in 2018 and to think about how we can grow in his grace in 2019. Below are a few different assessment questions and Bible reading plans to help you start 2019 strong. In addition to these ten questions, here are twenty-one more to help you “Consider your ways.” Think on the entire list at one sitting, or answer one question each day for a month. What’s the most important decision you need to make this year? What area of your life most needs simplifying, and what’s one way you could simplify in that area? What’s the most important need you feel burdened to meet this year? What habit would you most like to establish this year? Who is the person you most want to encourage this year? What is your most important financial goal this year, and what is the most important step you can take toward achieving it? What’s the single most important thing you could do to improve the quality of your work life this year? What’s one new way you could be a blessing to your pastor (or to another who ministers to you) this year? What’s one thing you could do this year to enrich the spiritual legacy you will leave to your children and grandchildren? What book, in addition to the Bible, do you most want to read this year? What one thing do you most regret about last year, and what will you do about it this year? What single blessing from God do you want to seek most earnestly this year? In what area of your life do you most need growth, and what will you do about it this year? What’s the most important trip you want to take this year? What skill do you most want to learn or improve this year? To what need or ministry will you try to give an unprecedented amount this year? What’s the single most important thing you could do to improve the quality of your commute this year? What one biblical doctrine do you most want to understand better this year, and what will you do about it? If those who know you best gave you one piece of advice, what would they say? Would they be right? What will you do about it? What’s the most important new item you want to buy this year? In what area of your life do you most need change, and what will you do about it this year? Many Christians take the beginning of a new year to evaluate their Bible reading habits and then change or begin a Bible reading plan. Read through the Bible in a year with readings five days a week. Read through the Bible in a year with each day of the week dedicated to a different genre: epistles, the law, history, Psalms, poetry, prophecy, and Gospels. Read through the New Testament in a year, reading Monday to Friday. Weekends are set aside for reflection and other reading. Especially beneficial if you’re new to a daily discipline of Bible reading. Read through the Bible at your own pace. Use this minimalistic yet beautifully designed chart to track your reading throughout the year. Four daily readings beginning in Genesis, Psalms, Matthew and Acts. A year-long study in the Gospel of Matthew from Tabletalk magazine and R.C. Sproul. Duration: One year | App: Accessible on YouVersion. Download the app. Reading ten chapters a day, in the course of a year you’ll read the Gospels four times, the Pentateuch twice, Paul’s letters four to five times, the Old Testament wisdom literature six times, the Psalms at least twice, Proverbs and Acts a dozen times, and the Old Testament history and prophetic books about one and a half times. Read the New Testament and Psalms twice and the Old Testament once. Read straight through the Bible from Genesis to Revelation. Two readings each day, one from the Old Testament and one from the New Testament. This plan does not have set readings for each day. Instead, it has set books for each month and a set number of Proverbs and Psalms for each week. It aims to give you more flexibility while grounding you in specific books of the Bible. Read the Old and New Testaments once and Psalms and Proverbs four times. 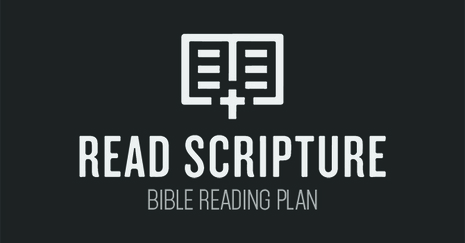 The Read Scripture App https://www.readscripture.org/ and the YOUVERSION Bible App are also great digital resources that feature videos, articles, plans, and notifications so that you stay up to date on our Bible Reading in 2019. I hope you all had a wonderful Christmas with family and friends. Join us tomorrow as we continue the "Advent of the King" sermon series looking at the ministry of John the Baptist from Matthew 3. Elder Candidate Nate Porter will be preaching and Ministry Intern Isaiah Huntington will be leading us in worship. Join us for Breakfast at 9am and Worship at 10am.